Today, the ability to build applications that leverage emerging technologies including Internet of Things, cogitative, machine learning, and leveraging digital transformation separates the winners from the losers. However, using “cheaper” unsupported community software to build these applications has unforeseen cost disadvantages. 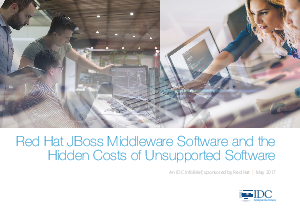 IDC asked eight organizations using Red Hat JBoss Middleware solutions how their experiences with Red Hat compare with using community unsupported software. Read this analyst research report to learn how interviewed organizations capture significant value by investing in Red Hat JBoss solutions rather than using unsupported community software.